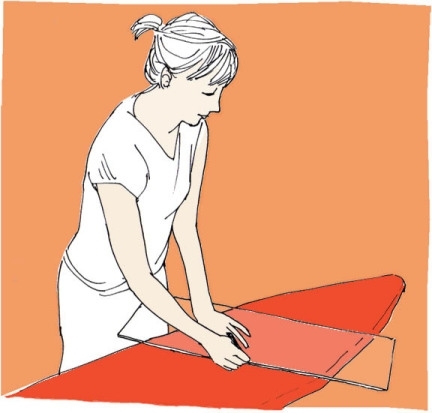 We used to have a strong aversion to ironing, hiding our iron in the bottom of the closet and neglecting our rickety hang-on-the-door ironing board. 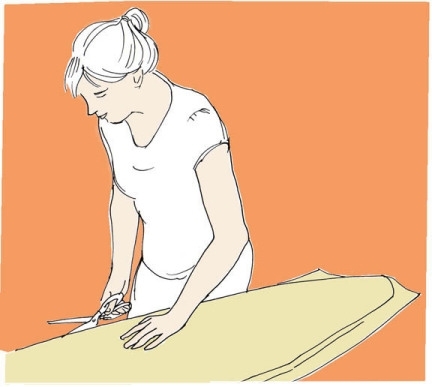 Then one day we learned to love ironing because we love sewing. Taking the time to press your fabric makes a big difference in the construction of any project, and it’s no big deal once you know how to do it. We came to understand that sewing needs ironing; otherwise our sewing room becomes a very un-Zen place. 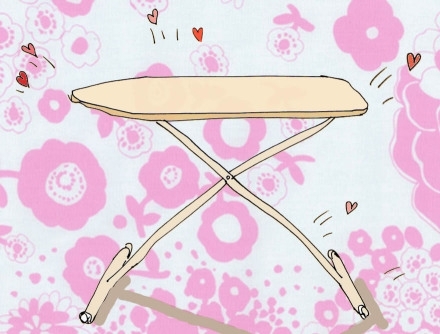 So we upgraded our ironing board with a beautiful new cover, and made friends with our iron. 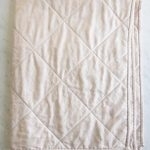 Wash and press your new fabric. Lay pattern paper over ironing board so that it covers it completely. Use tape to hold it in place. Trace the outline of the board. Cut out your custom template. Place the paper template on fabric; pin in place. Mark a 2.5 inch border on the fabric around the template with a ruler. Cut the fabric along this border using the pinking shears. Set aside. Place the paper template on the batting and pin in place, just as you did with the fabric. If you use the mid-loft batting, you may want to fold the batting and cut two layers out at once. Cut around the edge of the template, then lay it on the ironing board and trim any excess batting. The batting should sit neatly on top of the board without drooping over the edges. Layer the fabric right-side up on the batting. Baste in place, making sure to capture all of the batting. 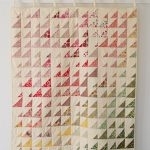 It may be helpful to mark a simple pattern on the fabric before you quilt it. I marked diagonal lines, spaced about 4 inches apart, at a 45-degree angle. You don’t need an intricate design, just a few simple lines to secure the batting. Quilt the cover. Backstitch at the beginning and end of each line, at the edge of the batting. It is not neccessary to stitch all the way to the edge of the fabric. Lay the cover right side down on your work table. Turn and pin a 1/2-inch hem all the way around the edge of the cover. Clip once or twice into the curves to make it easier to turn. 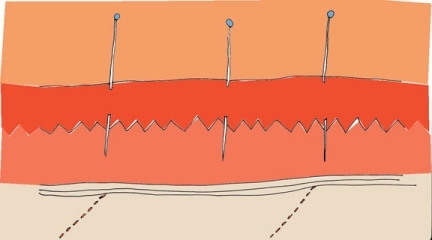 Sew the hem with a scant 1/8-inch seam. Thread the cotton twine or elastic through the hem using a bodkin or safety pin. Fit the cover on the ironing board and secure it in place with a bow (If you use elastic, overlap the ends and stitch them together). Tuck the ends of the bow into the hem if you like. Because my ironing board is sort of narrow, I added two bands of elastic to the underside of the cover, one-third of the way from the front and one-third of the way from the back. 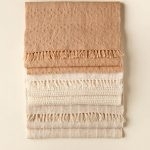 These help keep the cover in place when it is in storage, or when I’m ironing something unruly like a giant tablecloth. Okay, that doesn’t happen very often, but when it does I’ll be ready! fabric: 2 yards cotton fabric of your choice for a full-size ironing board, or 1 1/2 yards for a small board. 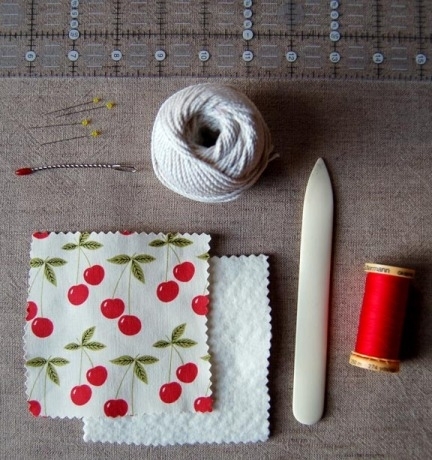 I chose this cherry print from Elsie’s Kitchen by Anna Griffin for Windham Fabrics. batting: I used two layers of twin size mid-loft cotton batting for a firm padding. You may prefer a high-loft cotton batting. pinking shears: These shears have serrated teeth that prevent unravelling. 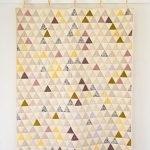 pattern paper: You can find pattern paper or tracing paper at Purl Patchwork. bodkin: This helpful tool is used to draw the twine through the narrow hem of the cover. You can also use a safety pin. marker: I like the Hera Marker because it marks the fabric without ink, similar to the bone folder pictured. Much to read and learn here, I’m sure I will enjoy !